We originally met through a friend and had our first date at Lilli Pilli Reserve, the same place the ceremony was held. It was almost instant and by the end of the night we were finishing each other’s sentences. We got engaged on the same day we met and got married (31st January). Aarron proposed on the top of the Ferris Wheel on the Gold Coast after a romantic dinner. 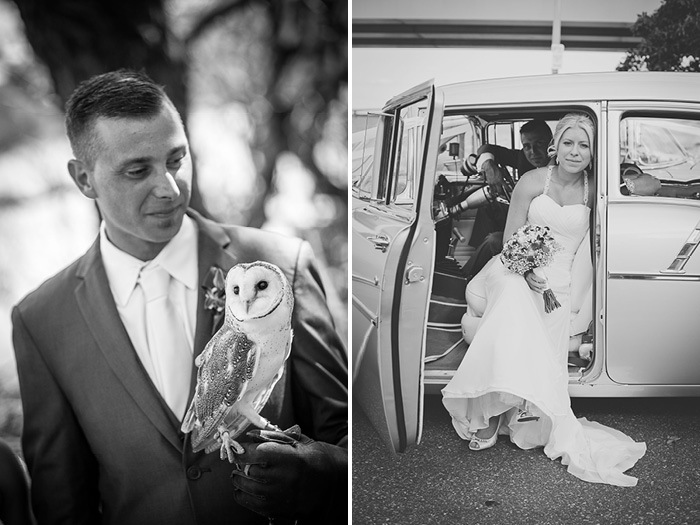 We wanted a relaxed yet elegant and formal wedding. The colours we chose were navy blue, silver and white. This was also to suit surroundings of the ceremony and reception which were both near the water. My grown was A-line dress with beaded straps. I bought the dress at Sweethearts Bridal in Blacktown. My inspiration was to still look like myself and capture my style. Bridesmaids wore long navy dresses. Each bridesmaid had different straps. Dresses were bought from Hugs for Brides, Rockdale. The bridesmaids had only babys breath bouquets and my bouquet included babysbreath, white roses and blue/purple orchids. This choice was also to incorporate the surroundings of the ceremony, my favourite flower (orchid) and also my mother had babys breath for her wedding 32 years ago. The tables had navy blue runners and a large candle in the centre. The room had fairy light draping’s from the room and behind the bridal table. The bridal table also had letters and a love heart block made in acrylic with our photos in them. The look on my husband's face when I walked down the aisle. We had an owl deliver our wedding bands. Pretty much the whole day! We chose our photographer as she was bubbly and had a great personality. From her portfolio and photos in her studio it was clear she is amazing at what she does. We love the variety and natural shots she has taken. Sam has definitely captured our day perfectly.